Lately, my days have been super super busy. Both work & home. Work is usual but home is a bit coz of festive fervor. Guess its not just me, Diwali is round the corner and everyone in my neighborhood and in my family/friends circle seem to busy with the festive planning. Oh yes! Diwali, is a big big celebration in India. It’s a very prominent Indian festival which span up to four days. Family, friends and lots & lots of food is the idea of enjoyment. Trust, in today's world of the illumination of homes with lights and the skies with firecrackers is an expression of obeisance to the heavens for the attainment of health, wealth, knowledge, peace and prosperity. So, i was talking about my busy schedules these days! Too much of cooking-shooking happening in my kitchen. My preparations for Diwali party are on! Any family get together is a perfect time for feasting! Honestly, my work schedules don't permit me to call for a big feast on a weekdays and Sundays mostly get engaged in boring household queued up errands! So i compensate when there are festivals. I always look forward to hosting such fun parties. Gives me an opportunity to share my love for food with my loved ones. What can be a better idea than this! Chaat, the famous Indian street food had been in my mind for quite sometime now and after enough brainstorming i settled on for some of those sweet-tangy savories. 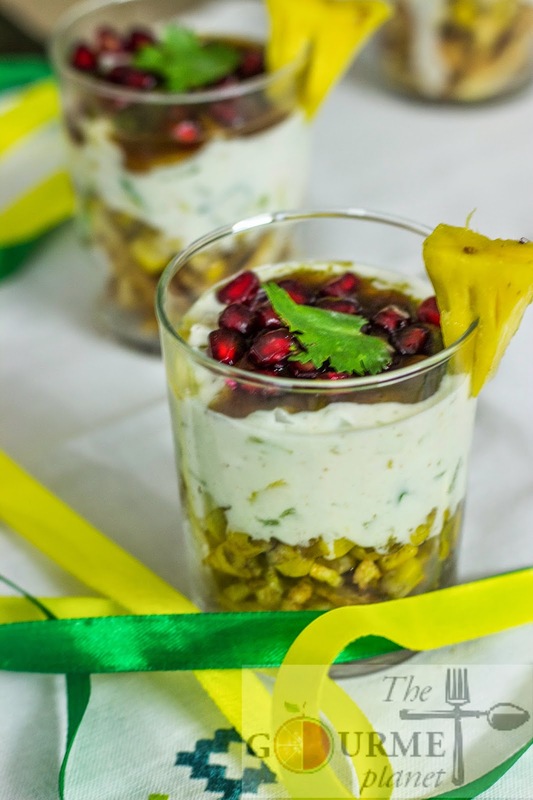 An unusual combination of ingredients was my idea of chaat for 2014 diwali bonanza! So before serving to the guests on the D day, i did some experiment yesterday with a few items handy and trust the end result was marvelous! 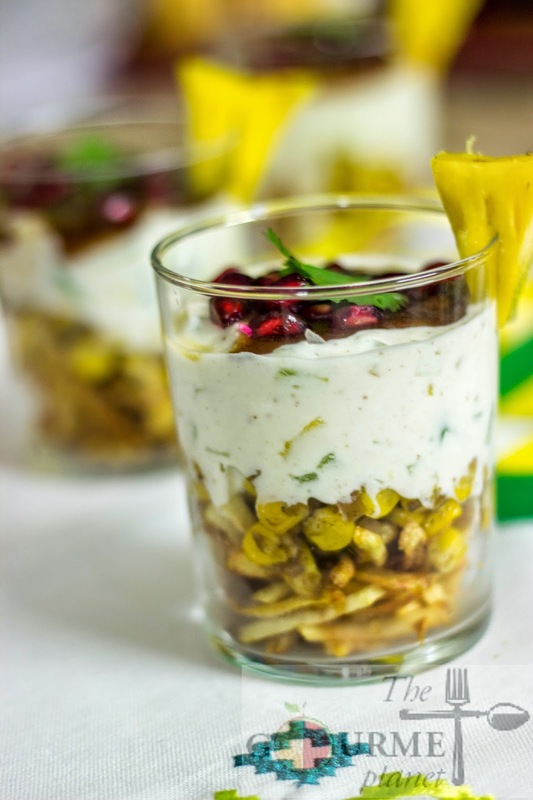 Corn and pineapple perfectly blends in my invention and have rendered diverse flavors to the chaat. Tanginess from pineapple and creaminess of the corns delivered a new dimension to this much acclaimed street food! Its a must must for this Diwali coz this dish has all the traits of a winner! 2. Rinse the potato juliennes under run water very vigorously. 3. Soak them in cold water for sometime. 4. In the mean time, heat oil in a wok. 5. While the oil is getting hot, drain the potatoes and remove the excessive moisture by patting them well with a dry kitchen towel. 6. Now simmer the flame and add the potatoes in batches. 7. Keep the flame on medium now and constantly monitor the potatoes. 8. Once they appear crisp and light brown in color, with the help of a slotted spoon, seive them out of the oil and put on a napkin. 1. Place a griddle pan on a medium-high heat and add 1 tbsp oil. 2. Once hot, carefully add the ginger and saute well. 3. Now add some finely chopped onions. NOTE: You do not have to roast ginger and onion.Just saute till the point they smell aromatic. 5. Add chaat masala, black salt, red chill powder and toss well. 6. Lid the griddle for 2-3 minutes allowing the flavors to completely seep into corn kernels. 8. Transfer to a bowl and allow it to cool. 2. Add chopped cucumber, chopped pineapple, green chillies, black salt, sugar, roasted cumin powder, and chopped coriander leaves. 3. Now add freshly crushed mint leaves and whisk thoroughly. 2. Place the fried potato crisps at the bottom of the glass covering 1/3 of the space. 3. To the next layer add the corn masala covering 1 inch of length. 4. Now spoon in a big dollops of cucumber pineapple dip and spread properly till the circumference covering the remaining space. NOTE: Just ensure that you do not over load till the rim else while eating. Leave a few cm below the rim to allow you to mix while eating else it would create a mess when you dig into it. 5. To this concoction, add the the green chutney, sonth and sprinkle some pomegranate seeds. 6. Place a coriander leaf at the center and arrange a triangular shaped pineapple wedge on the rim of the glass. Serve it immediately coz else it will become soggy. This tangy-creamy beauty is filled with the crunch & the munch in every bite. The taste will leave you tongue tickling and will make you go bonkerzzz!